Passion doesn’t come with age. Passion is built in since the day one is born. Age, usually, showcase the passion into constructive work. People say that a talent is nurtured through age but probably, Wayne Gretzky was an exception to this because Gretzky showed his skating skills at the tender age of two. The age where toddlers usually learn to walk independently, was the age for Gretzky when he would move around in his skates. Surely, this determination and passion made Gretzky one of the world’s best hockey player. Gretzky served the game of ice hockey for two decades. He retired from this game in 1999 and was included into the Hall of Fame the same year. Gretzky was born on January 26, 1961 in Brantford, Ontario. Gretzky showed his interest in skating from the youngest age possible, at the age of two. Soon he began spending more time on ice. Over the years Gretzky excelled as skater, shooter, and passer. Age was never a barrier for him and he was able to tackle his competitors who had massive age gaps. Gretzky scored a spectacular 378 goals in his final years of peewee hockey. As the age and maturity kicked in, Gretzky game continued to have more fame and recognition. By the time he was 15, he started playing for the Peterborough Petes of the Ontario Hockey Association. Gretzky dominance was unparalleled. In 1978, Gretzky proved to the whole country that he is a future NHL star by scoring the highest in World Junior Championships in Quebec City. Wayne Gretzky wanted to turn into a professional but he was too young to be turned into one. However, in 1979, Gretzky took part in his first full NHL season. He showed the world that he is the super-man of the ice hockey. He threw the punk into goal net without any difficulty. He swirled, twisted, and made the goal. He was making the numbers, impossible for the debutant to make. He was shining in the whole tournament and he racked up 51 goals and 86 assists on his very first appearance which led him to receive the league’s Hart Memorial Trophy, an award which recognized its most valuable player. There was a time when Canadian’s toy stores had Gretzky dolls. The government of Canada also issued an official Wayne Gretzky dollar coin. Gretzky’s down-to-earth and humble attitude made him more likeable among his fans. Meanwhile, he was busy playing hard and smashing the records. He had the highest number of goals and assists. His excellence was unmatchable. In 1988, he was traded to Los Angeles and Gretzky wore the Kings jersey for the first time. He remained associated with the franchise for eight seasons. Although, he wasn’t as dominating as he was in the earlier years of his careers however, he was still the best player of the NHL. In 1993 he led the franchise to the Stanley Cup finals but the franchise lost in the finals. During his final playing years, Gretzky joined St. Louis Blues and, within a year difference, New York Rangers. Gretzky proved to be the hockey’s most dominant player. He is possibly the highest scorer and holds or shares 61 NHL records, which includes, most career goals (894), most career assists (1,963), and most career points (2,857). In 1999, Gretzky graciously retired from the game. Gretzky also contributed in the game as the head coach. In 2002, when he was the program’s executive director, the Canada’s mens Olympic team brought home the gold medal at the Salt Lake City Games. Gretzky, however, didn’t remain coach of the hockey team for a long period. He turned down from the position of coach in 2009. He also gave up his ownership of the team. 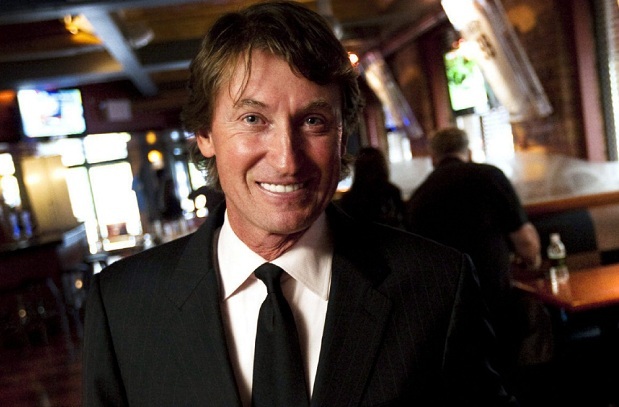 Wayne Gretzky also runs the restaurant business and the wine business and he is living happily with his family in California.